Claire Theaker-Brown is Owner and Founder of Unbelts, the progressively-made pant perfector. The company has recently undergone a rebrand and expanded into new markets. Claire Theaker-Brown has had the entrepreneurial bug since she was a child. Always art focused, Claire started setting up tables and selling her drawings, even offering bulk discounts to her customers. While in university, Claire studied industrial design and Mandarin. Her business began in 2011 while she was living in Shanghai. The company’s original name, Flatter:Me Belts was changed in 2017. As Claire describes her choice to re-brand, “Flatter:Me Belts was a name from when I was thinking small. When I first started, I couldn't imagine that we would be selling beyond the Canadian market. As the company embraced its new name, they also began to embrace new markets. As an entrepreneur, building supportive community around you is essential. “I belong to a mastermind group and have belonged to a few peer mentorship groups, including PeerSpark™. In the beginning, I found business owners I really clicked with in Shanghai and we met every single week for a brain slam. It was hard to lose that community when I moved to Edmonton. My first Canadian phone call was to AWE. Learn more about Unbelts and their story at unbelts.com. Laura Asham is the Founder behind Asham Creations, an award-winning company that sells puppets for educational purposes. After getting her entrepreneurial start creating beadwork projects, Laura saw a market opportunity for educational puppets and embraced the potential for a new business concept . Laura Asham has been beadworking since she was seven years old. After learning the art from her mother and sister, Laura found a love for the craft. In 2008, she began designing various beadwork projects as a part-time business while she finished her education in social work. Her newfound hobby quickly shifted into her greatest business opportunity. 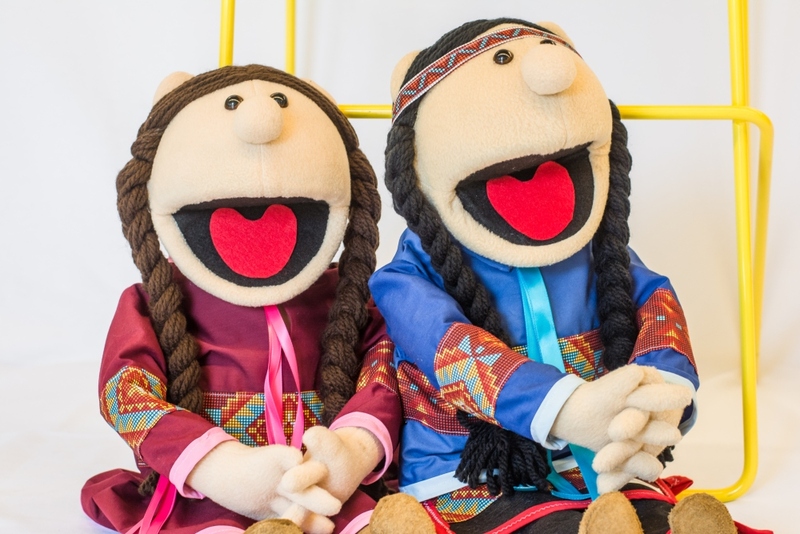 She started selling puppet sets to schools across a variety of First Nation communities in Alberta. Since then she has had requests from schools as far as Peguis First Nation in Manitoba where they had a school-wide naming ceremony for the characters. Laura participated in AWE’s NextStep to Success Program for Indigenous Women this past year. She said it was great to have the assistance she needed to create her business plan. Laura is in the process of finishing her business plan and securing funding to open her first commercial space. Linda established EWI Works in 1991, a company that provides innovative ergonomic services and solutions to businesses locally, nationally, and internationally. She was a finalist for the 2016 AWE Upsurge Award. In 2015, Linda took part in AWE’s PeerSpark™ program. “We were now with a group that could support us in a logical pathway to make these decisions to change a business stream,” she said. “It felt like, to be absolutely honest, a safe place. We were able to actually talk about some of the concerns we had without feeling like somebody was going to judge us.” With AWE’s support, Linda and her team will be able to expand her business into the United States and beyond. To support this expansion, Linda secured a loan through AWE, which helped her business growth immensely. “I didn’t realize all the available financing options,” she said. “I think it’s quite common for female entrepreneurs to self-fund. I would do lots and lots of jobs, save up the money, and then self-fund the next step.” In addition to AWE financing, AWE’s team introduced Linda to other financial resources to support her efforts to build a market for the company’s new technology. Continuous learning and adapting to new challenges are not new to Linda. She began the business with an Occupational Therapy degree and in order to better understand how products were developed she completed her Master’s in Environmental Design followed by a Ph.D. in Occupational Therapy from Boston University. Her curiosity and adaptability are two of her biggest strengths as a leader. Her visionary approach to growing her business was captured in her selection as a finalist for the 2016 AWE Upsurge Award. “If there’s a new technology or a new way of doing something, I’m not scared to go out and try it.” Linda said. An example of this is seen in Linda’s interest in expanding EWI Works into the United States after twenty-five years inside Alberta’s borders. “I went on a trade mission with AWE last year to understand the market and how people do business in the U.S.,” she said. “We’re going to want to penetrate into Europe and Australia down the road as well.” The team at AWE has the utmost confidence that Linda and her team at EWI Works will quickly become experts in their new field. Naomi is the CEO and co-founder of JobJar and an alumnus of the PeerSpark™ program. Michelle is the founder and Executive Director of Alberta AdaptAbilities Association, a registered charity providing special needs children and young adults with a variety of quality programs that target the development of the whole individual, while providing peace of mind to the families in the stress of everyday challenges. Michelle is an alumnus of the PeerSpark™ program. Meghan is the founder and CEO of Localize, an awareness platform to educate shoppers about where their food comes from. She leads the vision to build a service that shares better food information at the shelf’s edge, so consumers can finally shop in peace with the right information at hand. Meghan was the 2016 AWE Emerging Innovator Award recipient. Robyn is the founder and CEO of The Uncomplicated Family Corporate Group – a group of companies that includes Kids Uncomplicated Inc. (Clinical and Family Support Services) and Communities Uncomplicated Inc. (Software Development: Teleroo™ Technology). She was the 2016 AWE Upsurge Award recipient. Faith is a talented physical therapist who has owned and operated successful health clinics since 1992. She is currently the owner of Rejuvenation Health and a strong advocate in the health and wellness arena. Faith was a finalist for the 2016 AWE Upsurge Award.